The Modular Series D lift is driven by dual 2" ram direct-acting hydraulic cylinders, and has no cables, chains, bearings or other components that can break or require lubrication. Available with either a 5 ft x 5 ft or 6 ft x 6 ft carriage, and in either 2,000 lbs and 3,000 lbs capacity models, the new lift easily moves loads to heights of 15 ft at a speed of 17 feet per minute. The unit is fully self-supporting and, depending on the application, can be loaded and unloaded from any of three operating sides on both levels. Unlike comparable competitor models, the Pflow Modular Series D uses no chains or cables, requires no safety cams, requires no expensive drop tests and requires far less maintenance and parts replacement. 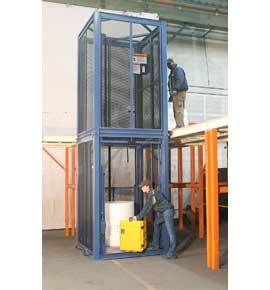 The new modular lift also fully meets ASME B20.1 code.